Get the best team since monkeys and bananas! It's the Baby Banana Brush Combo-Pack! 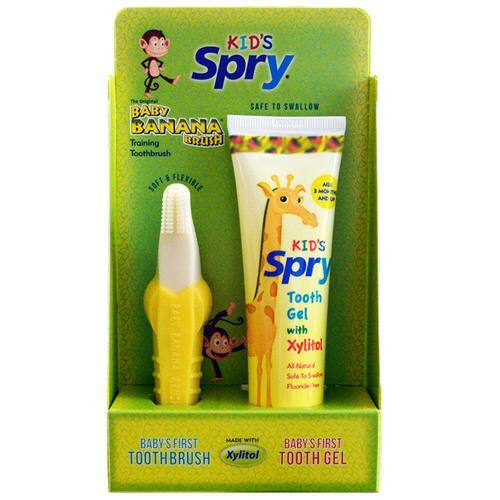 Get both the Baby Banana Brush and the Kids SPRY Tooth Gel in one toddler toothbrush package that will have them smiling! The Baby Banana Brush Combo-Pack contains the Original baby toothbrush made of soft silicone that massages and bends around you child's mouth during teething. It also comes with the all-natural tooth gel that tastes great and nourishes developing teeth with calcium and xylitol and it's fluoride free so it's safe to swallow! Get the Baby Banana Brush Combo-Pack with both great products for this packed price now and watch your child smile! Notas: 100% medical grade silicone. Dishwasher safe for sanitizing. All products pass tests for BPA, lead, phthalate, latex free. Gel is all natural, safe to swallow and fluoride free.